This summer I've made a commitment to myself to ride my bike to work at least once a week, ideally, two or three times. I rode in yesterday for the first time this year, and it was a bit of reminder of how things can start out tough. My ride is a fairly scenic one, and I do get to ride with Meg for the first three kilometres or so. 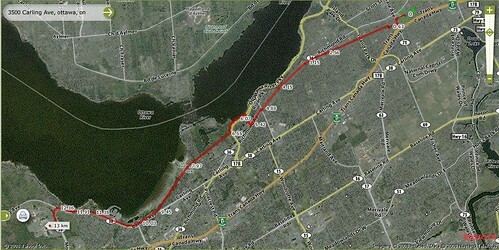 After that, it's 10 kilometres mostly along the Ottawa River to the Nortel campus. The ride Tuesday was good, though it took a little longer than I would have liked at 45 minutes or so. I found my legs were getting tired from just being in constant motion, though my cardio was fine. Hopefully that will improve over the next little while. The bike home was a bit nicer as I had the wind at my back instead of the slight headwind I faced in the morning. Unfortunately, I don't know that I can bike every day, but my hope is to reduce the use of the car by 20% over the course of the year, which I figure can roughly be done by riding at least twice a week and maybe taking the bus a few times in the winter. Days where Meg and I play Ultimate, I'll likely have to drive and any time I really need to be dressed up all fancy. Submitted by kevin@haggaret.com on Wed, 2008-05-07 21:43. You're doing better than me Dave. I too plan to bike into work as much as possible this spring/summer/fall but unfortunately that hasn't happened yet. The toughest thing for me is the fact that I have to either drop Liam off in the morning or else pick him up after work. In both cases I *could* potentially use the chariot attached to the bike, but that just seems like a lot of work at this point. I think I'll just stick to cycling in on days when Liam is not in daycare.